December 2017 - A/C Covers, Inc. I just bought a new air conditioner for my house. When it was being installed, the I asked the technician if I should buy an air conditioner cover to help protect it during the winter months, when I wasn’t using it. He added, “We like to recommend a company called, AC Covers out of Michigan.” In looking this up on the Google, the company is A/C Covers, Inc., www.accovers.com. So the researcher in me decided to take a journey over to the A/C Covers website. Unique Design Feature: A/C Covers brand air conditioner covers are designed to be inches shorter than the metal bottom of the air conditioner to allow for proper air flow. Our designs were created from the minds of HVAC (heating, ventilation and air conditioning) industry professionals and take little, but important, details like this into consideration. This is a trademark design feature of our brand. Covers, which go all the way to the ground, like the generic “one-size-fits-all” covers, trap condensation, which lends itself to accelerated rusting and can decrease the life of your unit. Also, it is more likely that a small animal (mice and other critters) will nest in a ac unit that has a cover go to the ground. These small animals tend to chew on wires, which also decreases the life of your unit. The bottom edge does not come with a hem and it will remain as sturdy as the rest of the cover. It will not unravel, become tattered or roll up. It will remain in its current condition for the entire life. Our warranty is full coverage, 100% of all aspects of the product. Every air conditioner cover (and all other covers) are custom made to my specific air conditioning unit based on the model number. I think this is the BEST FEATURE. A/C Covers says that it will fit like a glove. 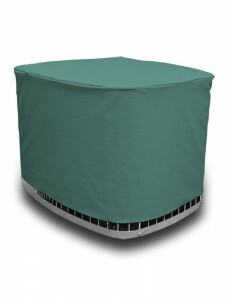 Price: I found A/C Cover air conditioner covers on their website, and on Amazon. Website: $84.99 including shipping 2-4 weeks for delivery. Amazon: $89.99 plus FREE shipping. Total: $89.99 but quicker delivery. Not an Amazon Prime item, but Amazon says it ships within 10 days of ordering. This is listed as a custom product on Amazon, because you have to add in your manufacturer and model number. So, you are paying a little extra for it to be delivered faster. Summary: I have decided to take the recommendation of my heating and cooling company and buy an A/C Cover. If I am going to spend a few thousand dollars on a new air conditioner, I will willingly pay for a good ac cover and make it so I get all the life out of my air conditioner.